In December of 2015, North Carolina mother Marty Peele contacted Health Impact News through their MedicalKidnap.com website in the hopes that we would tell her story of how her "miracle baby" had been taken away from her and the father of the baby with allegations of "child abuse." Local media had published stories portraying them as child abusers, in spite of the fact that Marty had suffered 8 miscarriages, was well respected in her community and church, and had worked with other family's children for over 17 years. Doctors had even testified that their child was suffering from infantile rickets, which would cause brittle bones. But they still did not get their baby back after 19 months, so they contacted Health Impact News, and we published their story at MedicalKidnap.com. 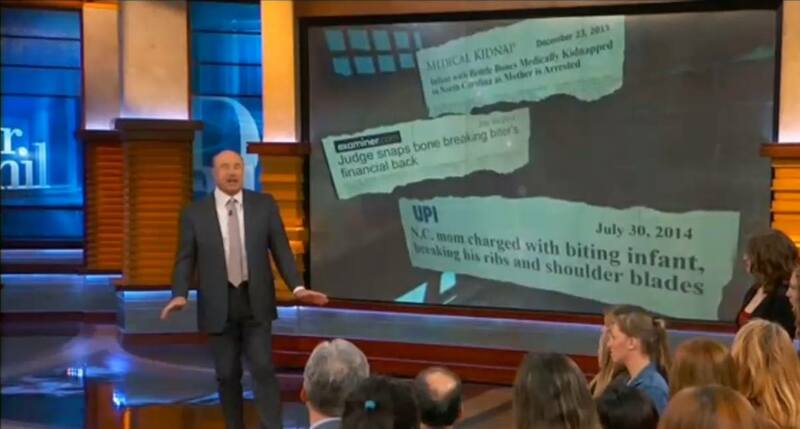 The Peele family's ordeal has now appeared on the Dr. Phil show, and joining them on the show were several doctors who gave their expert testimonies in Marty's defense, confirming that there was a medical reason for Micah's broken ribs, and that it was not a result of child abuse. Testifying on the show were Dr. J. Patrick Whelan, EDS (Ehlers-Danlos syndrome) genetics and pediatrics expert, Dr. David Ayoub, radiologist and published rickets expert and lecturer, and Dr. Doug Benson, orthopedic surgeon who has been involved in the case for some time. Also a guest on the show is attorney and child advocate Areva Martin who said: "The system has just run amuck on this case." DHS has taken their powers and run with them. Individuals forget when DHS does an investigation you are often stripped of your rights. They abuse their power to remove children that have actually been abused or neglected and have turned it into a money making scheme. They make poverty a crime, will lie under oath, will give babies and children to the highest bidder. People don't believe it until it happens to them. We must fight we must stop this madness. This case presents easily understood medical diagnosis. There were not "he fell down the stairs" comments or actions that can not be validated buy the diagnosis. What is sick sick sick is how they will continue to persecute a family (notice I say family because the children are abused by this process too) even when they know certainly that what they allege did not happen. Truth is, once they have their claws in you, they will not let go and will continue to search for abuse- which is whatever they say it is - for as long as they can regardless of wether or not their original allegations are groundless. Heather, both of your comments are right on! So, how do we, as American Citizens, stop it? You are so right, 40 years is a long time and these monsters have become way too powerful. You are also right about how it usually only comes to light when it happens to white families. What can we do? What can be done to stop them? Please join our KY group on MK and help us come up with a solution. Make an account on MK and then click on the groups tab at the top to join the group discussion. Unfortunately this situation is not rare, not even exceptional- this happens every day to people in all states. CPS has been allowed to run amok, unfettered by a compliant judiciary that allows them to put families through hell in the name of saving children. Only, CPS and its like are the biggest perpetrators of child abuse the world has ever seen. Poor and minority people have suffered under this oppression for forty years. Its only coming to light now because the internet spreads these stories and they occasionally target middle class people. When middle class white people suffer suddenly the news notices. When its poor or minority people they just assume we are all abusers and we and our children deserve the abuse we get from CPS and the courts. This case is typical typical typical. Its a sham, its horrendous, and the only thing it does not do is save children. My daughter is experiencing this same exact situation as we speak and we have no where to turn for help they have her baby and putting her through a nightmare !!! Admin---Orissa said: > In December of 2015, North Carolina mother Marty Peele contacted Health Impact News through their MedicalKidnap.com website in the hopes that we would tell her story of how her "miracle baby" had been taken away from her and the father of the baby with allegations of "child abuse." Local media had published stories portraying them as child abusers, in spite of the fact that Marty had suffered 8 miscarriages, was well respected in her community and church, and had worked with other family's children for over 17 years. Doctors had even testified that their child was suffering from infantile rickets, which would cause brittle bones. > > But they still did not get their baby back after 19 months, so they contacted Health Impact News, and we published their story at MedicalKidnap.com. > > The Peele family's ordeal has now appeared on the Dr. Phil show, and joining them on the show were several doctors who gave their expert testimonies in Marty's defense, confirming that there was a medical reason for Micah's broken ribs, and that it was not a result of child abuse. Testifying on the show were Dr. J. Patrick Whelan, EDS (Ehlers-Danlos syndrome) genetics and pediatrics expert, Dr. David Ayoub, radiologist and published rickets expert and lecturer, and Dr. Doug Benson, orthopedic surgeon who has been involved in the case for some time. > > Also a guest on the show is attorney and child advocate Areva Martin who said: "The system has just run amuck on this case." Our daughter got ill in 2006, with what turned out to be subdural haematoma and retinal haemorrhages,(shaken baby syndrome) she now is a healthy 10 year old apart from a left Sided mild cerebral palsy. 2 years prior to this we lost a baby boy aged 11 weeks. Our daughter got rushed to hospital by us at 8 weeks old. She was taken away from us when we got back to our local hospital and currently resides with her paternal grandmother after months of fighting for it and to get her back. We had no.criminal prosecution but the family courts decided we were probably guilty both of us. Maternal mother had undiagnosed problems, but has since been diagnosed recently of mitochondrial cytopathy a genetic disorder. The accusations were shocking considering we had lost a child due to natural causes pneumonia due to suddenly stopping breathing all we wished for was that this baby would be healthy and did everything to protect her, we never wanted to go through that trauma again so why would we harm her, but no-One seemed to understand this from hospital to the local authority. We have regular contact with her still 5 days a week (which has made employment and life difficult) but every minute with her is worth it. Also have contact unsupervised and never been any issue or harm come to her. We havent had more children through fear of what may happen. Am now wondering if this genetic disorder could well be connected as symptoms sound very similar and not sure what to.do next. Wouldnt want to put daughter through anymore medical tests and not sure the doctors would want to entertain the idea. I hope the hospitals some day will stop messing up peoples lives through false diagnosis. Also she had, had.an accident in her pram but doctors didnt believe it could have caused her injuries which were mpared to a car crash or being dropped from a great height. Admin---Orissa said: > In December of 2015, North Carolina mother Marty Peele contacted Health Impact News through their MedicalKidnap.com website in the hopes that we would tell her story of how her "miracle baby" had been taken away from her and the father of the baby with allegations of "child abuse." Local media had published stories portraying them as child abusers, in spite of the fact that Marty had suffered 8 miscarriages, was well respected in her community and church, and had worked with other family's children for over 17 years. Doctors had even testified that their child was suffering from infantile rickets, which would cause brittle bones. > > But they still did not get their baby back after 19 months, so they contacted Health Impact News, and we published their story at MedicalKidnap.com. > > The Peele family's ordeal has now appeared on the Dr. Phil show, and joining them on the show were several doctors who gave their expert testimonies in Marty's defense, confirming that there was a medical reason for Micah's broken ribs, and that it was not a result of child abuse. Testifying on the show were Dr. J. Patrick Whelan, EDS (Ehlers-Danlos syndrome) genetics and pediatrics expert, Dr. David Ayoub, radiologist and published rickets expert and lecturer, and Dr. Doug Benson, orthopedic surgeon who has been involved in the case for some time. > > Also a guest on the show is attorney and child advocate Areva Martin who said: "The system has just run amuck on this case." The same thing happened to us, but someone said we were burning our kids with cigarettes and it was a skin rash. Here we are 18 months later trying to get our 3 year old triplets back. James-Cunha said: > Admin---Orissa said: > > In December of 2015, North Carolina mother Marty Peele contacted Health Impact News through their MedicalKidnap.com website in the hopes that we would tell her story of how her "miracle baby" had been taken away from her and the father of the baby with allegations of "child abuse." Local media had published stories portraying them as child abusers, in spite of the fact that Marty had suffered 8 miscarriages, was well respected in her community and church, and had worked with other family's children for over 17 years. Doctors had even testified that their child was suffering from infantile rickets, which would cause brittle bones. > > > > But they still did not get their baby back after 19 months, so they contacted Health Impact News, and we published their story at MedicalKidnap.com. > > > > The Peele family's ordeal has now appeared on the Dr. Phil show, and joining them on the show were several doctors who gave their expert testimonies in Marty's defense, confirming that there was a medical reason for Micah's broken ribs, and that it was not a result of child abuse. Testifying on the show were Dr. J. Patrick Whelan, EDS (Ehlers-Danlos syndrome) genetics and pediatrics expert, Dr. David Ayoub, radiologist and published rickets expert and lecturer, and Dr. Doug Benson, orthopedic surgeon who has been involved in the case for some time. > > > > Also a guest on the show is attorney and child advocate Areva Martin who said: "The system has just run amuck on this case." > > The same thing happened to us, but someone said we were burning our kids with cigarettes and it was a skin rash. Here we are 18 months later trying to get our 3 year old triplets back. @James, If you would like us to consider your story for publication, you can share your story with us here: https://medicalkidnap.com/contactus/. It is very common for the parents of vaccine damaged children to be charged with murder (instead of the doctor or big pharma) Never believe anything the medical monopoly tells you! They have no credibility or morals at all. They are the useful idiots in a worldwide eugenics movement. Truth to this horrid matter is coming out more & more. Thanks to Dr. Phil & all others in this article for helping truth out. De-fund CPS, place all employees in jail.